Salentica®, a Gold Certified for Microsoft Dynamics CRM partner and a market leader in providing innovative Client Relationship Management (CRM) technology solutions for Wealth Management, announced today their sponsorship and participation at the Schwab IMPACT®2013 Conference. “As returning exhibiting sponsors we look forward to meeting with both Advisors and Schwab at IMPACT®2013,” says Tanya Tygesen, Vice President, Salentica. Salentica®, a Gold Certified for Microsoft Dynamics CRM partner and a market leader in providing innovative Client Relationship Management (CRM) technology solutions for Wealth Management, announced today their sponsorship and participation at the Schwab IMPACT®2013 Conference that will take place at the Walter E. Washington Convention Center in Washington, DC on November 10-13, 2013. Salentica® CRM with Schwab OpenView Gateway™ provides users with real-time integration with Schwab custody data; demonstrations will be available during IMPACT at the Salentica booth. “As returning exhibiting sponsors we look forward to meeting with both Advisors and Schwab at IMPACT®2013,” says Tanya Tygesen, Vice President, Salentica. 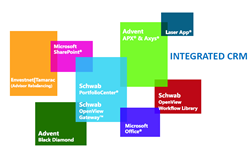 Salentica CRM provides pre-built integration with Microsoft SharePoint®, Microsoft Office® including Outlook, Laser App®, Schwab OpenView Gateway™, TD Ameritrade Institutional's Veo® advisor platform (Q4 2013), Envestnet | Tamarac (Advisor Rebalancing), Advent (APX® & Axys®), Advent Black Diamond along with an integration framework for solutions such as Schwab Portfolio Center®, Fidelity, Orion and SunGard. Find out more about Salentica and this event at http://www.salentica.com/events/2005-2/. Salentica is in the leading CRM solution on the Microsoft Dynamics platform providing innovative integrated Client Relationship Management (CRM) and document management solutions for independent investment advisors. We have a successful track record of over 25 years in developing and implementing financial software. Built on the Microsoft® Dynamics CRM foundation, Salentica solutions seamlessly integrate with various portfolio systems providing clients with a full range of benefits. Salentica is a Gold Certified Microsoft Dynamics CRM partner. Salentica® CRM, is the property of Salentica Inc.